Finding Your Why. 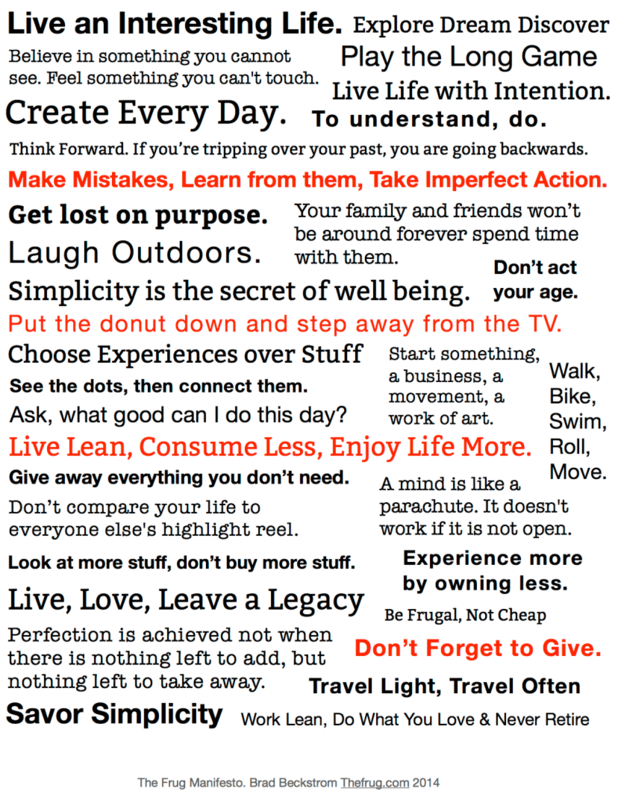 How to Create a Personal Manifesto. I watched a show with my son yesterday, which he loves, called Food Network Star. He enjoys cooking shows, particularly those which involve intense competition and chefs being eliminated. One term that kept coming up over and over on the show was “POV.” “What’s your POV?” the judges would say. “Your POV is not coming through!” The judges would then proceed to tell the celebrity chef hopefuls what their Point of Views were or should be. “You are Coastal Kitchen Gal” “You are the Butcher Babe” You are the Cowboy Chef” On the show, you could be a very talented, gregarious chef but if your POV was not coming through to the judges you’re as good as gone. I am not a fan of reality TV but it is true that the characters that we remember in fiction, and in real life, have a well defined POV. Their mission, their view of life, attitudes, and intentions bleed through in everything they do. I believe a great way to discover your own POV is to start with a personal manifesto. Manifestos are popular with groups, companies, charities, and political parties but for our purposes we want this to be personal. A well-defined personal manifesto can anchor your point of view and that will start to come through in everything you do. Parts of it can even inspire others. Most people have a good handle on what they do and how they do it. What’s often missing is the why. We should start with the why. Why do you do it? Author Simon Sineck has one of the most viewed Ted Talks of all time about Starting with Why. Starting with why is important for any organization, political party, or company but it’s especially important for you, because it’s your life. How to craft your personal manifesto. Get inspired. Start by looking at some great examples. Don’t be afraid to use famous quotes if they inspire you. Don’t jump right into it, just start writing down things that inspire you. Look through old journals, books, think of things you remember from childhood, or that your grandmother told you. She heard it somewhere and passed it on, now it’s your turn. I highlight great quotes online using a web clipper from Evernote. Pinterest is also great for this. Ask the question “what do you want your life to be like?” The Declaration of Independence is a great example of a manifesto signed by people who wanted their lives to be different. Keep going, write down a long list of statements, beliefs, personal thoughts, and attitudes. You’ll be cleaning these up later so just go with the flow, Jack Kerouac style. You may even end up with something the length of a book or the most read blog in the world like Leo Babauta did. Reread it a few times, after all, this is your manifesto, your personal Declaration of Independence, something your great-great-grandchildren may read, so clean it up a bit. Highlight things that really jump out. Mix things up, combine a few great quotes to create something that fits you. But hey, it’s your manifesto if you just want it to be three words, all profanities, roll with it. This manifesto looked so good it inspired a typographic movement and became a best-selling print. Use fonts, spacing and color to make it flow, to make it unique. Pages for Mac, Keynote or Google Docs are good free tools for this. Most important — Publish it. Put it out there. Frame it and hang it up. If you really want to put it out there, create a free WordPress blog or Post it on Medium.com. Search engines will find it, people will find it, people will share it, you’ll inspire others. You wrote it, now go Live it. A manifesto can change over time but it’s important to look at it often, even add something important you’ve learned, make sure it still represents who you are or who you aspire to be. So,here’s the Frug Manifesto.This is long overdue. I was inspired by the Holstee Print and a group of Misfits. If you’re starting a book, a business or a movement, it should be one of the first things you create. I’m taking my own advice and putting it out there. But, more importantly, I need to go live it.